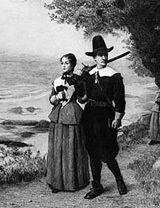 The Pilgrims' boat, the Mayflower, took a turn in the Atlantic Ocean in 1620 and these people from England via living in Holland for years wound up in the New World on a Rock called Plymouth Rock, what would later be part of Massachusetts. They wanted a new start in the world but weren't about to let the Jews have the same opportunity. Beginning in the sixteenth century, the Netherlands became home to numerous Portugese merchants, as the region, and particularly the city of Amsterdam, became a center of world trade and shipping. Among these merchants were many Marranos (called Anusim today), who had been forced out of Spain by the Inquisition in 1492. They kept their Jewish identities a secret, but, by the end of the century, had formed a community in Amsterdam, a city that did not recognize religions other than Protestantism. The community was discovered, and its leaders arrested, in 1603. As a result, some of the newly-acknowledged Jews moved to the towns of Alkmaar, Rotterdam, and Haarlem, which extended them protective charters. The majority, however, remained in Amsterdam, and even founded a second community there in 1608. Founded in 1602, the 1621 charter of the West India Company in Amsterdam''s intended purpose was to eliminate competition, particularly Spanish or Portuguese, between the various trading posts established by the merchants. The company became instrumental in the Dutch colonization of the Americas.."The New Netherland area, which included New Amsterdam, covered parts of present-day New York, Connecticut,Delaware, and New Jersey." 13 children) . They had come from Recife, Brazil. "These Brazilian Jews were the descendants of perhaps 5,000 Jews who had been living in Recife, most of them secretly, since the mid-1500s. The Dutch captured portions of Brazil from the Portuguese in 1624, and some neo-Christians openly returned to the practice of their Jewish faith. When Portugal recaptured Brazil in 1654, these Jews feared the introduction of the Inquisition and fled. They were probably on their way back to Amsterdam after a stop in Jamaica when their ship was attacked by a Spanish privateer who stripped them of their valuables. A return to Europe was now out of the question. 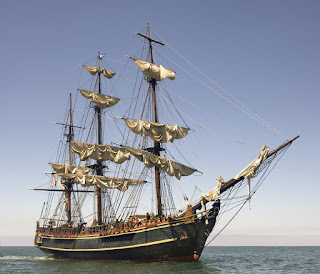 The refugees then made a deal with the ship's captain, Jacques de la Mothe, to take them to New Amsterdam, which they thought would be a hospitable destination." "From 1630 onward, the Dutch Republic came to control almost half of Brazil's area at the time, with their capital in Recife. The Dutch West India Company (WIC) set up their headquarters in Recife. The governor, Johan Maurits, invited artists and scientists to the colony to help promote Brazil and increase immigration. The Portuguese won a significant victory at the Second Battle of Guararapes in 1649. On 26 January 1654, the Dutch surrendered and signed the capitulation, but only as a provisory pact. By May 1654, the Dutch demanded that the Dutch Republic was to be given New Holland back. On 6 August 1661, New Holland was formally ceded to Portugal through the Treaty of The Hague." The Portuguese had conquered Dutch Brazil in 1654, and this group had to emigrate because of this. Not only were they told to leave, but they themselves feared the Spanish Catholic Inquisition from 1492, for it had never stopped seeking out Jews to punish on their racks or to burn them at the stake. These people had originally docked in Jamaica and Cuba, but the Spanish didn't allow them to stay there. Their ship went on to New Amsterdam, which was later named New York. .
working for the West India Company since about 1635. "The Jews who have arrived would nearly all like to remain here, but learning that they (with their customary usury and deceitful trading with the Christians) were very repugnant to the inferior magistrates, as also to the people having the most affection for you; the Deaconry also fearing that owing to their present indigence they might become a charge in the coming winter, we have, for the benefit of this weak and newly developing place and the land in general, deemed it useful to require them in a friendly way to depart, praying also most seriously in this connection, for ourselves as also for the general community of your worships, that the deceitful race---such hateful enemies and blasphemers of the name of Christ---be not allowed to further infect and trouble this new colony to the detraction of your worships and the dissatisfaction of your worships' most affectionate subjects." Evidently these 23 did not have passports! There were already 3 in New Amsterdam with passports that they couldn't get rid of. These 23 were from Dutch Brazil, too. Their anti-Semitism was dripping from this letter. To think that they themselves came from Holland, a far more broad-minded country than England ever was, and reacted like this was most disappointing to the 23 Jews after sailing for so long. England had expulsed Jews who were living there way back in 1290 and only allowed Jews to immigrate back in 1655, a year AFTER these Jews tried to land in the New World's New Amsterdam. Much to Peter Stuyvesant's surprise, among the directors of the Dutch West India Company were several influential Jews, who interceded on the refugees' behalf. Company officials scolded Stuyvesant and ordered him in a letter dated April 26, 1655, to let the Jews remain in New Amsterdam, "provided that the poor among them shall not become a burden to the company or to the community, but be supported by their own nation." Isn't it amazing? They were refugees and were not to get any help at all from the people of New Amsterdam. What if they all were without funds and were starving? Among those 4 men had to have been enough money to keep 23 people alive until they could get on their feet and exist like the rest of the colony were. They were traders. Evidently they had a rough go of it.
" He had referred to Jews as a "repugnant race" and "usurers", and was concerned that "Jewish settlers should not be granted the same liberties enjoyed by Jews in Holland, lest members of other persecuted minority groups, such as Roman Catholics, be attracted to the colony." Sometimes it turns out that how you treat others comes back to you in kind. "In 1664, King Charles II of England ceded to his brother, the Duke of York, later King James II, a large tract of land that included New Netherland. 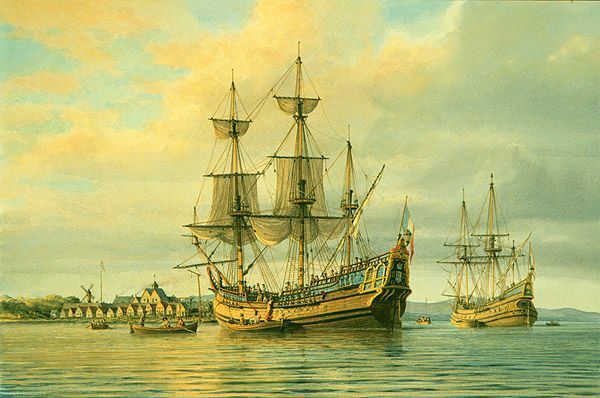 Four English ships bearing 450 men, commanded by Richard Nicolls, seized the Dutch colony. On 30 August 1664, George Cartwright sent the governor a letter demanding surrender. He promised "life, estate, and liberty to all who would submit to the king's authority." Stuyvesant signed a treaty at his Bouwerij house on 9 September 1664. Nicolls was declared governor, and the city was renamed New York. Stuyvesant obtained civil rights and freedom of religion in the Articles of Capitulation. The Dutch settlers mainly belonged to the Dutch Reformed church, a Calvinist denomination, holding to the Three Forms of Unity (Belgic Confession, Heidelberg Catechism, Canons of Dordt). The English were Anglicans, holding to the 39 Articles, a Protestant confession, with Bishops. No other people have ever had to live through 1654 years of persecution and hatred and death for a false accusation of killing another's God. That's where all this anti-Semitism comes from. For people who brought justice to the world in the 10 commandments, they find they are excluded from such by others.